PRODUCT: POWERS 27MM x 8MM HEAD DRIVE PINS, TYPE X-DN. 27MM LONG (1"), .145" SHANK. 100/BOX. PRICE/BOX. (100/carton, order full cartons for discounts). 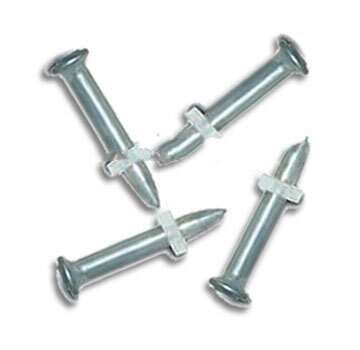 Drive pins with a 8MM head are designed for permanently fastening a fixture to concrete, some types of concrete block, and A36 or A572 structural steel. The pins are formed with a 0.145" diameter shank in various lengths, and a specially designed point to allow proper penetration into typical base materials. Knurled shank designs are available to increase performance in steel base materials. A plastic flute is mounted over the point to retain the drive pin in the fastener guide of the tool providing guidance during the driving operation.